Many recipes include milk as one of the main ingredients and because milk contains fat, it can be infused with THC just like butter, olive oil, and many other ingredients. Below is the process for making CannaMilk, or cannabis infused milk, to be used instead of or in conjunction with your Cannabutter. Add the milk to a pan or a double boiler over medium heat until it is gently simmering. Lower heat and stir cannabis in. Allow the mixture to continue simmering for about an hour. Allow to cool and then strain with cheesecloth or a fine mesh strainer. Pour into an airtight container in the refrigerator until needed. Use before the sell by date on the milk used. 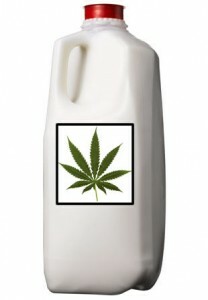 Once it has been chilled, CannaMilk can be drank straight as a refreshing drink. This particular recipe, however, can be rather potent depending on the quality of cannabis used. If you intend to drink it straight, we recommend decreasing the amount of cannabis or increasing the amount of milk used in the recipe. ← New site design !